The Twin Bonanza first flew in November 1949 (TC 5A4). Wid­ening the Model 35 Bonanza fuselage to accommodate three abreast and placing an engine on each wing equalled the Twin Bonanza. The US military used the Twin Bonanza as the L-23 Seminole,redesignated as U-8 in 1962. Four YL-23 were purchased in 1952 [52-1800/1803]. These were followed by 55 L-23A models [52-6162/6216] (most rebuilt later as L-23D. Forty L-23B [53-6153/6192] were purchased and a single XL-23C [55-3465] in 1955, converted to U-8G. 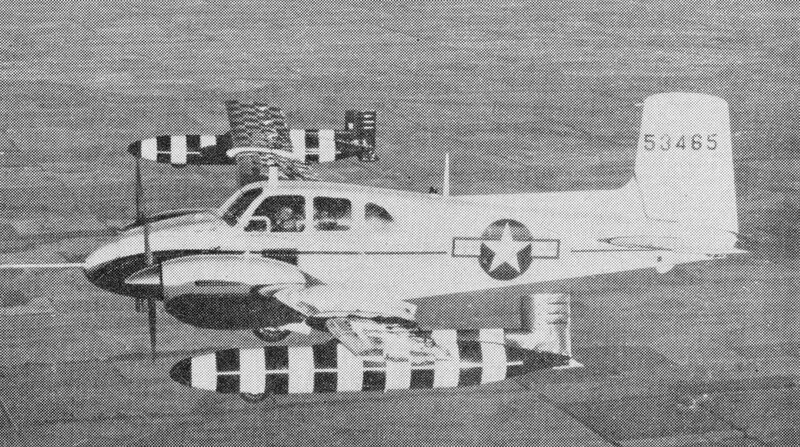 L-23 trials included “flying fuel tanks” to greatly increase fuel loads with the extra wing area attached to the tanks offsetting the greater weights involved. Both civil and military versions continued to be developed through various marks. In 1958 the US Army sought an up-grade which lead to the development of the L-23F with its enlarged cabin. It was the first post-war light twin to reach quantity production in the United States, and late models grossed 7300 pounds. Built with 260, 275, 295, and 340-hp Lycoming engines, the Twin Bonanza design has proved highly versatile. Beech produced the military U8 Seminole, the civil Queen Air and early King Airs from the Twin Bonanza wing, and Swearingen has marketed a conver-sion of the basic Twin Bonanza as the Excaliber. The design started life as a six-seater, and a seventh was added on the J model in 1960. There is so much room inside that numerous luxury executive interiors have been custom-installed. The aircraft has also been successful as an ambulance plane with room for a stretcher and medical attendants, in addition to the crew. From the L23F derivative of the Model 50 Twin Bonanza Beech developed the civil Model 65 Queen Air with it first flying on 28 August 1958. Initial climb rate 1450 fpm. Takeoff distance (50’) 1260 ft. Landing distance (50’) 1452 ft.
Wingspan: 45 ft. 3 in. Overall length: 31 ft. 6.5 in. Initial climb rate 1270 fpm. Takeoff distance (50’) 1450 ft. Landing distance (50’) 1840 ft. Engines: 2 x Lycoming IGSO-540-A1A, 380 hp. Max TO wt: 7300 lb. Equipped useful load: 2200 lb. Payload max fuel: 820 lb. Range max fuel/ 75% cruise: 797 nm/3.5 hr. Range max fuel / 55% cruise: 1343 nm/ 6.7 hr. SE ROC: 340 fpm @ 102 kt. Min field length: 2612 ft.
Pwr loading: 9.5 lb/hp. Max TO wt: 7600 lb. Equipped useful load: 2500 lb. Payload max fuel: 1120 lb. Range max fuel/ 75% cruise: 901 nm/4.4 hr. SE ROC: 440 fpm @ 102 kt. Min field length: 2178 ft.
Span: 45 ft. 3 in. Range: 985 miles at 190 m.p.h. No built: 85 [56-3695/3718, 57-6029/6094, 57-3084/3101, 58-1329/1353, -1357/1364, -3048/3092, 59-2535/2543, -4990/4992], included remanufactured L-23As. No built: 6 [56-4039/4044], plus 1 civil to military to civil [N1779G=66-15360=N5375G=N888JE=N74GV]. No built: 23 [55-3465, 56-3710, -4039, -4041, -4043, -4044, 57-6085 -6089, 58-1329, -1336, -1348, -1357, -1359/1360, -1363, -1364, -3055, -3057, -3062, 59-2536/2538, -4990].